Verified but with a caveat. Two people have verified the main board and the cab sim separately, but there are definitely biasing issues dependant on the JFETs you use. This was designed around the 2SK208 SMD transistors and so when using the common through-hole JFET, they will need biasing differently and so it would be a good idea to swap the source or drain resistors for trimmers for all JFETs other than Q4 which already has a trimmer. It may be a good idea to socket those resistor connection points so you can use a single trimmer to work out the required resistance to get the correct drain voltage for each transistor, and then using an appropriate value resistor in the socket rather than having trimmers all over the place. Thanks to Ice-9 on FSB for tracing and supplying the schematic. The original of this pedal used 2SK208 transistors which are only available in surface mount form. I have opted for J201's in the layout, but a bit of experimentation may be the order of the day in terms of trying other JFETs, and associated components to get them to bias. So this may be one for the tweakers at this stage until we have some good results with the alternative JFETs. Note that the input to the cab sim, would come from the output of the main board, so you would either have two output sockets (with and without cab sim) or you could have a single output socket and use a toggle to true bypss the cab sim. The device is intended for the production of sound peculiar to «drive» channels of Soldano* amps. It is distinguished by specific type of overdrive: open, wide and at the same time tough and dynamic. • AMT Legend Amps provide excellent playing dynamics characteristic for purely tube devices not in the least inferior to them. • With tube-like limitation the effects of the series provide an amazing density and power of sound. When using AMT Legend Amps you won't feel the need do cut out the most informative middle frequencies which in turn will provide great readability of your guitar in the mix. • Like tube preamps AMT Legend amps provide gradual increase in the number of limiting stages as sensitivity grows. • The preamps of the series use the passive circuits of tone formation which completely correspond to the adjustments of original tube overdrives. • The high level of the preamps output signal (+10dB at maximum Level position) is the same as of tube preamps. It gives you the adjustable signal level which allows to connect the preamp to any input including Input POWER AMP. • The preamps of the series are single-channel devices with passive bypass. So great dude, your awesome! If you have the P1, it will be great to post it! The next week, I'm ready to build the OCD, Deep Blue Delay with Tap Tempo and the rat!!! I can't waut! I don't have the P1, but I do have the B1 schematic which I will do next week sometime. 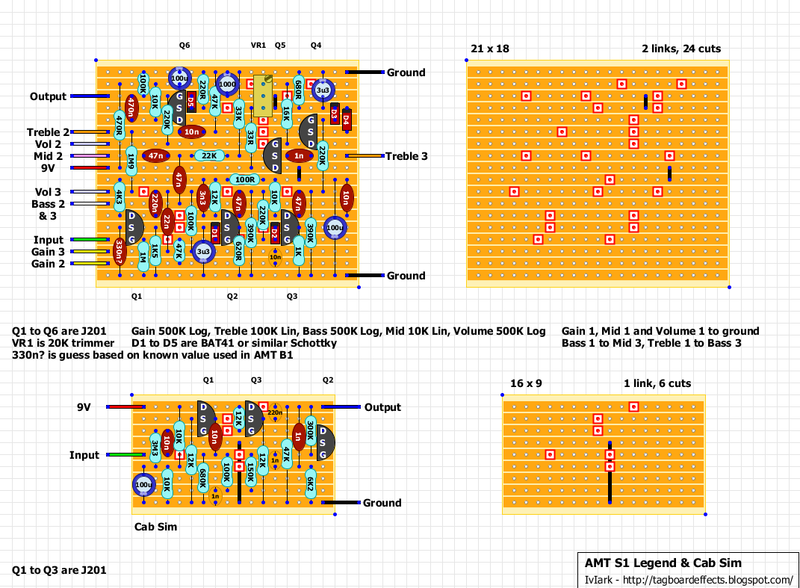 I love the demos of these AMT pedals so I'll do all of them as the schematics appear. Good luck with your builds, they're all verified (other than the tap tempo daughterboard) so they should turn out fine. I'd recommend socketing the ICs in the daughterboard, just in case some tweaking is needed to get the best results with the DBD. Just a thought, Could you just use the amp simulator circuit as a pedal itself? or even add it to another circuit? Cool, Might try that..could be handy to record direct too..
On the cab sim what is the value for capacitor marked CX? There was a few values still missing from the cab sim so I'm waiting for more info to help fill in the blanks. Here is a schematic from Victor at AMT for a more complicated cab sim which could give a few ideas about the missing values. Might find this useful...? 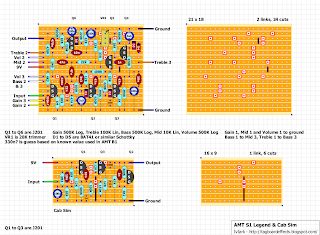 Here is a schematic for speaker/cab simulation by Victor Kampf the creator of the AMT pedals/preamps... Looks interesting! By the way I have a P1 and a SS-30... The P1, B1, and E1 all use the same board so, I will try to compare the difference between the P1 and the B1.. I haven't even opened the SS-30 up yet but I can pretty much bet it's all SMD. The S1 and B1 had SMD one side and through hole on the other. If you can take some high res pics of the P1 there's a chance that we can see the differences from that, although some of the values may end up being a pain like with the S1. I must say that I've been more impressed by the AMT demos I've heard than the range of effects from any other manufacturer, and I don't think they're too expensive either. I'll probably buy a couple of the new "*2" range when they come out to support the builder. Sometimes it's just worth it to have an original. Yeah, they really are not expensive at all considering the killer tone and dynamics that they produce! They really are meant to be preamps though so running them into the input of an amp may or may not give good results! They seem to sound best going into the fx return on a tube amp.. Although I think the cab simulation is one of the best on the market! My P1 seems to be a newer board rev#... like ver. 3A or something? Seems to be pretty much the same with a few minor changes. The top side through hole is loaded on the P1 and less surface mount caps on the bottom... I took some Hi-res shots, the file is about 67 megs but you should be able to get some ideas from them.. I will get the values of the top side caps if you think you can reverse engineer it? Anyway, you can download the pics here just let me know when you have so I can delete them or I will just delete them in a couple days..
Hee hee, thanks for the pics, I'll check them out. Does anyone have this working yet ? Any tips for setting up ? The layout seems right for the cab sim but people have struggled to get it working. The original used SMD transistors, for which there is no through hole equivalent and the different characteristics seem to be creating problems biasing the fets. Have you built it yet? If not I'd suggest just sticking to the main board and omitting the cab sim until someone can experiment with other fets and values to get it working. I've just finished the main board and will be testing tonight. OK, So it's not working, but I'm making my way through replacing the drain resistors with trimmers to bias the J201s. Mark - any chance you could post the schematic ? I replaced all the drain resistors with trimmers , except for Q5 , whose drain goes directly to 9V. I then biased them all to 4.5V and I am getting a sound. Progress ! There is the beginning of a working circuit here, but there's not much gain - sort of like a tube screamer on  , even with all the knobs maxed. OK More progress. There was a post on FSB about duff J201 transistors. I just changed out all the J201s and I'm now getting the high gain sound I would expect. A fair bit of oscillation as I adjust the controls so it might take some time to bias all the JFETs. Will report back ! Nice one, J201's certainly seem to be temperamental! OK - Final update. I've built this and got it working by (1) New J201s and (2) Adding bias trimmers. It's not *quite* as high gain as I would like it ,as Q2 oscillates if I bias it too hard. Otherwise - very happy with it. Excellent, is that both the main board and cab sim? Just the main board - I didn't build the cab sim. Anyone build this successfully? Main board or Sim? I'm confident the sim layout is correct but because of the different through hole JFETs we had to use a simulation that someone did on FSB has shown that it won't bias correctly as it is. So I'd hold off from building either until someone does some experimenting to find the best values to use to bias the JFETs. I suspect the main layout may need the drain resistors swapping for trimmers to allow the FETs to be biased accurately individually, so if you want to build an AMT pedal then I'd suggest trying the B1 in the meantime which already includes trimmers and has been verified. Mark, I've built the cab sim today, worked like a charm. Great sounding sim, so you can count the cab sim as verified!!! I built the cab sim and it sounds great, but has very very low output - even with the distortion unit I have in front of it cranked...any ideas? I have the same problem. Did somebody fix it? I'm about to build it with 2n5485s instead of the j201s as I couldn't get them locally. I'll post back when it's done and tested. Built and tested the cab sim only. The output is so low as to be unusable. Should they all be 4.5 ish volts?? Got a microphonic component but where? I added trimmers to Q1 and Q3. On Q3 I needed a 50K as 20k would only get me down to 6v. All Jfets are now running 4.5 v. I replaced Q3 as the squeel seemed to come and go from there as I rotated the bias pot....no change. It stops when the bias reaches 8v but of course the circuit does not sound correct there. As it is the pedal sounds fine with the output almost cranked, but man does it ever have a lot of signal at that level. It would be nice to get it to work at more sand output levels. Any theories on the microphonic component would be welcome as I am running out of things to chase down! Got it solved! Once I biased by ear I got it to a happy place. I had to crank Q1 way up to 8v before it came around. That made all the difference. IMHO biasing all the j-fets (except Q5, it will show full input voltage) to 4.5v does not work well on this build. Use your ears no matter what your voltmeter says. As an aside, this build made my rethink my bench amp, a battery powered practice amp. The interaction between the pedal's output and the input stage of the amp contrived to make the high squeeel I have been dealing with. Gone when I connected to my main rig. Just a heads up - if something is really wrong, try a couple of different amp setups with your build before you smash it with a hammer! I just noticed that after all this and adding trimmers that I came right back where I started from as far as bias voltages go. The change came when I drove a real tube amp through the line input (effects return). Such is life! I know this layout is pretty old...but in case anybody wanted to try it without the hassle of dealing with J201's...there's an exact equivalent to the 2SK208 SMD transistors in a TO-92 format (and available on Tayda for $0.38). It's the 2SK30A (listed on Tayda as the 2SK30 2SK30ATM-Y N-CHANNEL 50V 6.5MA). I checked and double checked the datasheets...identical in every aspect.